It’s easier to forgive than forget. Forgiveness is unconditional, but forgetting is conditional. 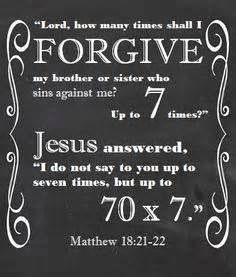 Dear Lord God, Abba Father, Jesus my Savior teach us the way of forgiveness. Deconstruct our thoughts on what forgiveness is. Give us sound scriptural guidance on how to get free from the pain and hurt of others, especially those who closest to us. Show us how to walk in your liberty and victory. In Jesus’s name we pray, Amen. This entry was posted on August 13, 2018 at 7:03 am and is filed under One Walk. You can follow any responses to this entry through the RSS 2.0 feed. You can leave a response, or trackback from your own site.